Are your children, grandchildren, nieces, nephews or god-children crazy about Paw Patrol? We bet there are plenty of parents out there with a passion for the Canadian animated TV series full of heroic pups too. You can’t help but love the ‘no job is too big, no pup is too small’ motto. The tales with ‘save the day’ themed rescue missions are cleverly and cutely carried out by a tech-savvy boy called Ryder and his team of adorable puppies. At Cakes by Robin we take your child’s birthday very seriously. The show-piece at any children’s birthday party, our Paw Patrol cakes make an awesome statement. 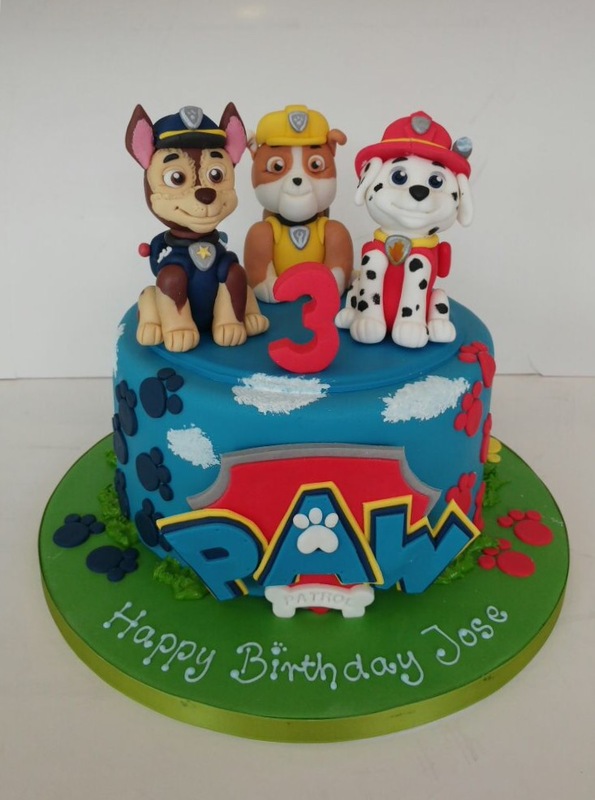 Whether your child’s favourite pup is Chase, Marshall, Rubble, Skye, Zuma, Rocky or Everest, we can make the perfect birthday celebration cake with Paw Patrol favourites standing proud. At Cakes by Robin we’ll turn your ideas and expectations into a beautiful and artistic creation that your kids and their friends will love. 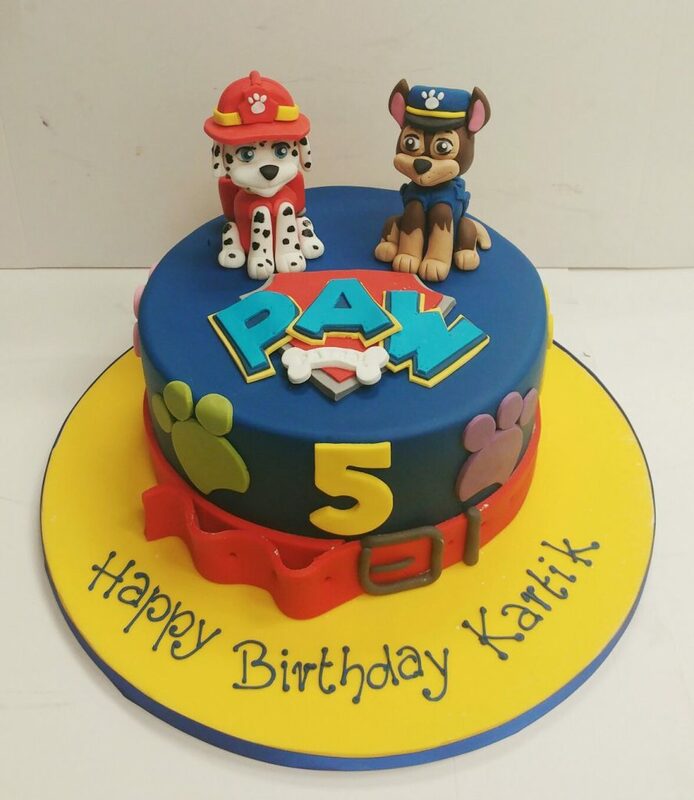 We understand how much kids love Paw Patrol adventures and we’ll do our best to bring one of their favourite episodes to life on a professionally crafted birthday cake. 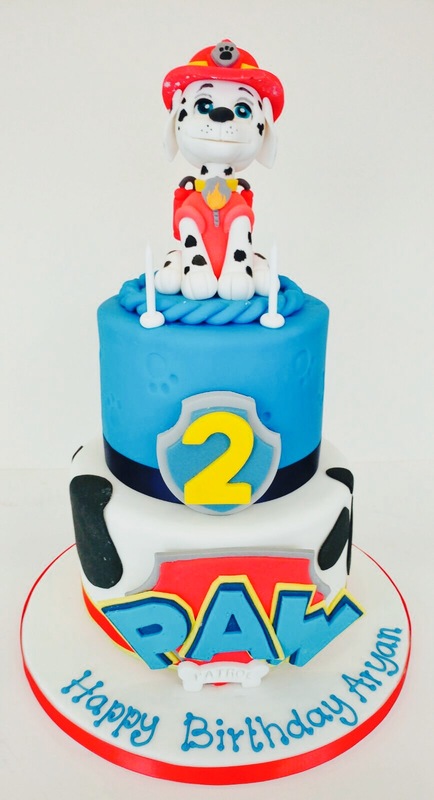 Whether your child’s favourite episode is Pups saving a school bus, Pups saving the Polar Bears or Pups saving a Robosaurus, we can design you a themed cake to excite your Paw Patrol followers. We are experts at transposing TV characters into cake form. Perhaps your child has come up with their very own idea for a Paw Patrol Adventure? If your child has a particular hobby or interest you may like to use your imagination and personalise your cake to combine two favourites. To help you in your decision-making, get in touch and book your consultation with one of our experts. At Cakes for Robin we are used to making the weird and the wonderful come to life in cake form. Not only will the outside of the birthday cake get some oohs, the cake itself is just important to us at Cakes by Robin. We can make your delicious, birthday centre-piece an absolute treat. From classic Victoria sponge to sticky toffee, lemon drizzle and even gluten-free, the cake itself will definitely get some ahhs. Our vanilla rainbow coloured sponge sandwiched with vanilla buttercream is a real showstopper. 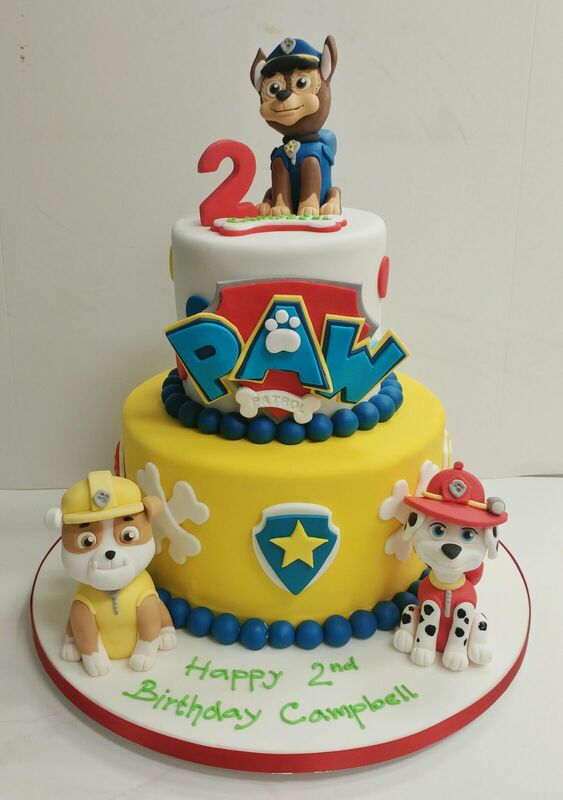 Combined with a bespoke Paw Patrol cake design, it will be the birthday cake all of your children will remember. At Cakes by Robin we can help you with more than just the cake. If you’d like a dessert table of custom made creations we can ensure your themed party is perfect. 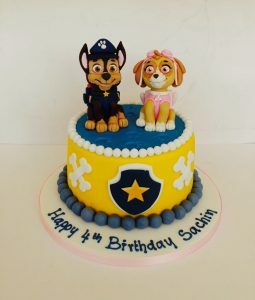 We regularly work with leading children’s party organisers, so you can guarantee we will deliver the very best in cakes and sweet treats for your Paw Patrol themed birthday party. Why not add a Paw Patrol cake pop to your children’s party bags. We’ll deliver anywhere within or around London, with delivery charges calculated by postcode, or your beautiful cake can be collected from our cake parlour close to Southfields tube station. No job is too big, no pup is too small. Cakes by Robin can save the day.